Sometimes, a certain piece of technology brings in a revolution. Apple's Macintosh brought in the graphical user interface that changed everything. Windows followed, and so did other operating systems. In the 90s, we saw a slow and steady rise in the use of laptops. In 2007, Apple released the iPhone. The business-oriented smartphones became overwhelmed with manufacturers designing smartphones for the consumer, giving rise to the sleek, wide, touchscreen devices that we consider the standard today. We saw the same with tablets. Apple released iPad in 2010 and it changed the world's view of tablets. They are found in so many homes now. They are sleek, non-convertible and usually come without a stylus, unlike the few business-oriented tablets that existed before the iPad. We may see a similar thing with convertible laptops and ultrabooks and a whole range of computers in the next couple of years. We are currently living through a revolution of computer design. Touch is the next big thing. Windows is the most widely used operating system in the world. It is relatively easy for Microsoft to change things single-handedly. When they decided to push the Metro UI from Windows Phone - which was not getting a lot of attention - to the desktop version of Windows, they were well on their way to change quite a few things. They were ushering in an era of touch-based devices. Yes, modern smartphones and tablets with touchscreens exist, but they are still considered, to quite an extent, a luxury. You won't see less tech-savvy seniors considering a tablet to replace their desktop or laptop that they are so comfortable with already. It's well out of their comfort zone. The mouse/trackpad and keyboard combo is just so widely accepted that touchscreens are considered technology for the "cool" people. It's not commonplace yet. There is no generation yet that has grown up with them. Microsoft's Metro interface, now called the Modern UI is largely designed for touchscreens. In fact, so many people say that Windows 8 is made for touchscreens and it is not a pleasant experience to use it with a trackpad or mouse and a keyboard. 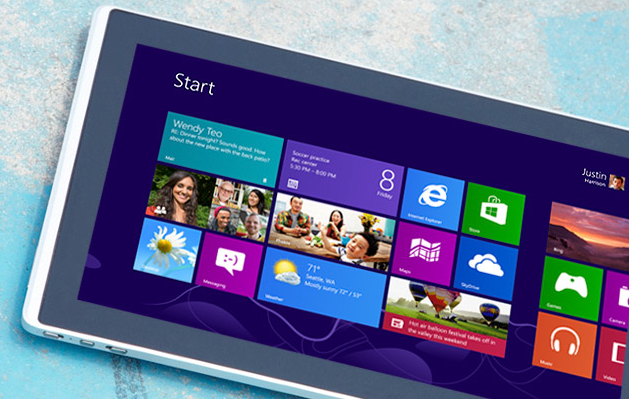 Microsoft has understandably started marketing Windows 8 for every device. They claim that it can be used as easily on a keyboard and mouse setting as it can be with a touchscreen device. According to them, it's an all-round operating system. When a company with such a wide user-base does it, it's bound to catch on. Never before have they pushed touch interface so much with their OS. Although Windows 8 is supposed to be an all-round OS, Microsoft themselves are pushing forward its touch features with their own Surface tablet. It's a tablet that works with a snap-on keyboard case. It's what Microsoft envisions the future of computing to be like. Surface from Microsoft is like Nexus from Google. It's what Microsoft [Google] wants Windows [Android] to be used like. And Microsoft's view of the future is quite bold. They are venturing into the wild with their flagship OS that is used in all sorts of workplaces. Until merely two years ago, we did not have "modern" tablets. Now Microsoft is basically pushing this new class of computers into all kinds of markets with their advertising; Surface is supposed to be good for both work and play. Considering Microsoft's actual view of the distant (20 years?) future, this isn't surprising. Take a look at the video above. 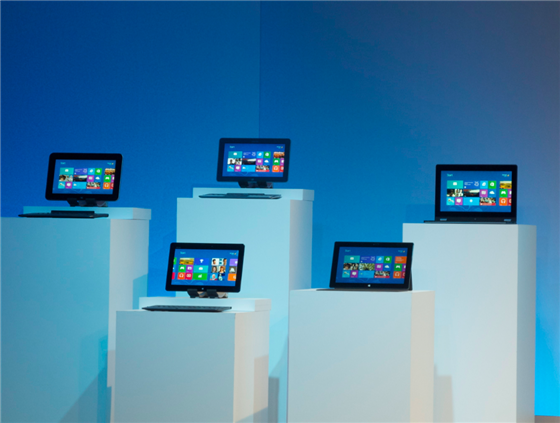 "New Era of Personal Computing"
Microsoft is also pushing forward this idea with Windows 8. They are working with manufacturers who are now designing computers that blend the lines between tablets and laptops (sometimes even desktops). Microsoft is not entering the post-PC era as Apple thinks of it. They are keeping the laptop and desktop form factors. 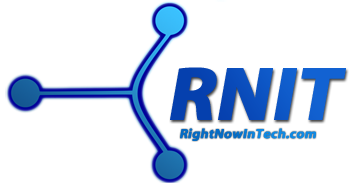 They know that it's a good design for productivity and tablets lean toward more casual uses. However, the touch interface doesn't really go well with laptops. 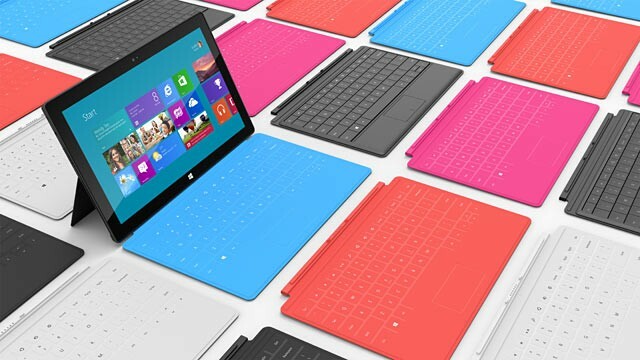 Microsoft is pushing forward convertible tablets and laptops. How do you bring in the futuristic touch interface of a tablet and the productivity-promoting design of a laptop together? Well, you blend the two form factors together. Intel is advertising their "ultrabook" term with some ads that show beautiful people using these stylish ultra-slim laptops that have screens that flip around, converting it to a tablet. We now have ultra-slim in the mix. These convertibles perfectly with Microsoft's idea of a touch-based computing future with Windows 8. It's really a new era, just like Microsoft wants it because such laptops have never been so big in the market before. We had those extremely bulky laptops with screens that would flip horizontally and sit on the keyboard, making it a monster computer with a resistive touchscreen that worked like a drawing tablet with a stylus. And they never had super-long battery lives or powerful components. These new convertibles have bright colorful ads that have young people using these computers on the go with their fingers rather than a stylus. The thing is, those convertible tablets were never marketed in this way. They were mainly laptops for business users and teachers who would write on the screen while presenting using a projector. 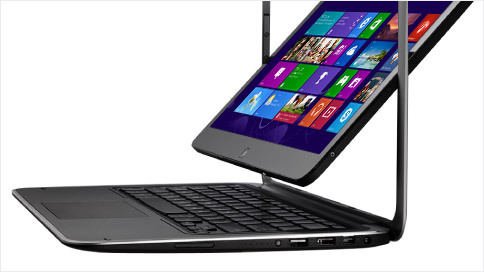 The convertible laptop/tablet form factor may be the new hip thing very soon. Desktop towers are old fashioned. Microsoft's website doesn't even acknowledge them. In the "new PCs" section, we see all-in-ones. They are the new big thing. We are advanced enough to put all the insides of a computer in its screen now. Before Windows 8 and Microsoft's crazy marketing for it, most all-in-ones apart from the iMac line were low-powered basic desktops that ran Intel Atom CPUs. I would see Windows all-in-ones at a store all the time, but they always seemed like computers no one cared about. Hopefully with Microsoft pushing the idea, the all-in-one will catch on. Oh, and have you seen this weird portable all-in-one that has a touchscreen? It's like a 20-inch tablet from Sony. It's really a confusing product, but it's still something that no one has tried before. Cool nonetheless. What about the old PC? The thing is, Windows 8 has just released and the world really hasn't changed yet. As Microsoft tries to usher in a new era of PCs, the problem is of adoption. Will people actually start using all-in-ones everywhere and crazy tablet-convertible laptops everywhere? It will take a few years. And it may never catch on at all. It's easy to predict that current-era laptops and desktops will stay around for a really long time; maybe even longer than I'd like. Where will all the computers that are currently in use go? And what about the majority of manufacturers who are still manufacturing regular laptops? They are here to stay. It's ben about a week since Windows 8 launched and the entire PC market is (currently) pretty much the same. I see a bright (near) future of PCs. If everything goes well, I'm sure we will have a future as Microsoft sees it (not the holographic super-integrated systems you see in the first video on this page). But I hope these new laptops catch on with the older crowd. If it doesn't, we'll have to wait another 10-15 years to see it happen. What are your predictions? How do you see it? Hit me in the comments below!